Boothbay Harbor Oceanside Golf Resort offers private coastal tours on our own luxurious boats. See historic lighthouses, seals, puffins or simply explore our quaint harbors and beautiful coastline. Boothbay Harbor Oceanside Golf Resort is now offering private coastal tours on our luxurious boats. See historic lighthouses, seals, puffins or simply explore our quaint harbors and beautiful coastline. See below for photos and descriptions of our boats. Have fun on a cocktail cruise aboard this classic beauty! Just sit back, relax and enjoy the incredible views! Enjoy a harbor tour on this classic launch. Have friends visiting and looking for something fun to do? Join us for lunch at Coastal Prime on our waterfront deck and then go on a quick tour of our picturesque harbor! Private excursions available and can be booked in advance. All boats are 6 person maximum. No children under 12. Drinks and snacks provided. We recommend bringing an extra layer as it can be cool on the water. Boothbay Harbor Oceanside Golf Resort has docks for use by those with boats who would like to have lunch or dinner at Coastal Prime. Hotel guests may dock their boat for the length of their stay. Island Mode is a special Hinckley. 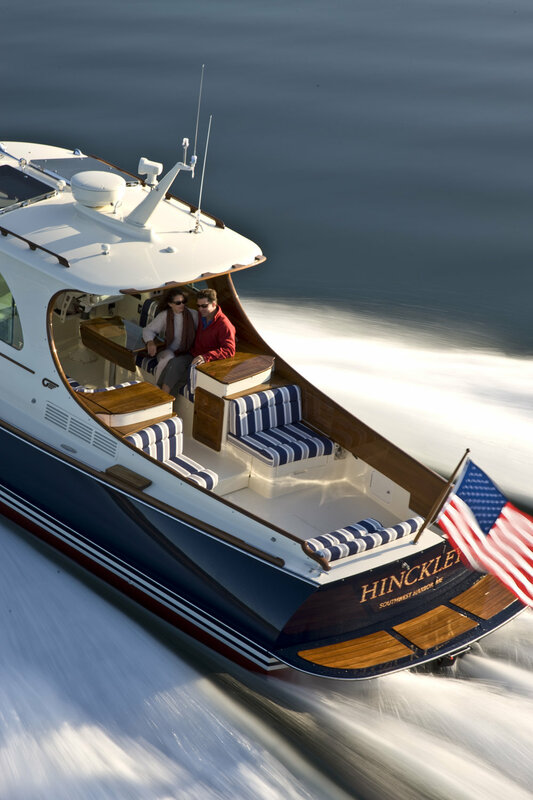 The custom hull color and extensive teak features make this an outstanding Picnic Boat. The cockpit has seating that includes cushioned forward-facing full settee seating and port and starboard aft-facing seats located at the forward end of the cockpit. 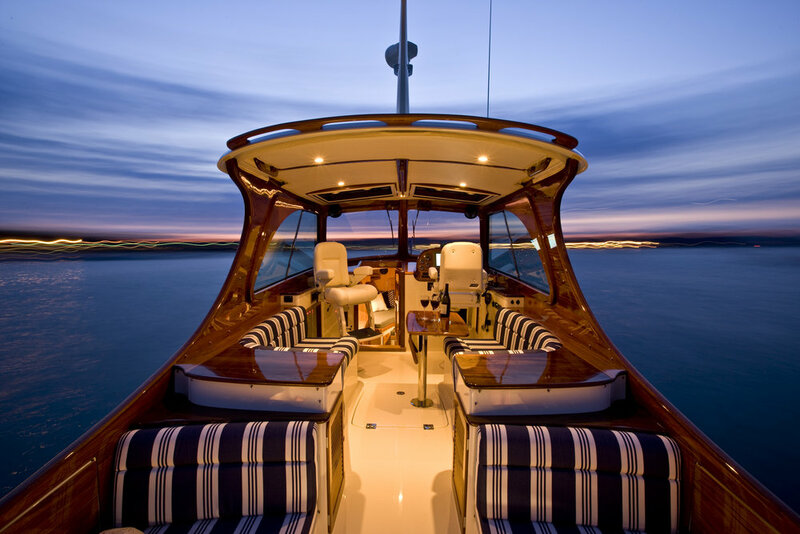 The pilothouse includes cushioned settees and a dining table with flip-down leaves. Oceanside was built by time-honored craftsmen of Crosby Yacht Yard. The launch displays the simplicity and timelessness of classic lines and demonstrates unmatched quality of workmanship. It is an uncomplicated, fun and safe way to see the harbor.